Manipal Education and Medical Group International India Pvt Ltd.
Wizcraft International Entertainment Pvt Ltd.
Aamatya Media Info Pvt. Ltd.
‘India-Japan Global Partnership Summit’ (a not for profit initiative of ICF) is envisioned as a summit led by two great nations along with their global partners- where policymakers, opinion leaders, business leaders, media and academicians Dream, Design, Discuss, Decide, Drive and Derive solutions to challenges of a new socio-economic framework by creating a ‘Micro Road Map for the Macro Vision’ that exists in the form of India-Japan Global Partnership. 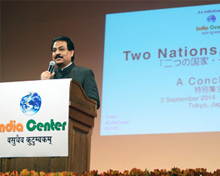 India Center recently organized a Conclave, “Two Nations, One Goal” on 2nd September 2014 at Hotel Chinzanso, Tokyo, Japan. The conclave was a unique initiative of India Center, under the leadership of Mr. Vibhav Kant Upadhyay, to catalyze interactions at various levels between Japan and India based on India Center’s R-M-E model that advocates strengthening Relationships and creating Mechanisms to contribute to vibrant Economy for Empowerment of people in India, Japan and their Global Partners.